However, relying on manual backups is not the most efficient way. That’s especially because it’s easy to forget to do them, which defeats the whole purpose. The solution: backup automation. Thankfully, UpdraftPlus offers this out of the box. Under the Settings tab, we have already seen the options earlier. Use the drop-down menus to choose how often the plugin should back up your site’s files and database. Options include every four, eight or twelve hours, daily, weekly, every fortnight, or once a month. Which time interval makes the most sense depends on your site. A very active blog with many comments needs more frequent backups than mostly static sites that rarely change. In addition to that, you can choose the number of backups to keep at hand. Again, decide this depending on the nature of your site. Further down you find additional options to configure what to exclude from the backup. You can also request the plugin to send a report via email when it is finished backing up. Finally, under Expert settings you are able to enable debug mode, define the size at which to split your archives, delete or keep local backup files and control SSL settings. Once satisfied, save your settings and your automatic backup should be fully functional. Note, that you might have to reauthorize access to your remote storage upon saving. Alright, now your precious site is being backed up to a safe place on a regular basis. However, what do you do when the unthinkable happens and you have to restore it from a saved version? Well, one of the best things when you back up your WordPress site remotely is that you can also us the remote backup to bring it back. UpdraftPlus makes this process very convenient. For example, let’s say you site completely crashed and burned and you need to get the saved version back. In that case, it’s enough to set up a fresh WordPress site and install UpdraftPlus on it. After that, connect to Dropbox (or the remote back up location of your choice) as before. Then, click on the big Restore button. In the next menu, if the list is empty, check on Rescan remote storage. This should populate your list with your existing remote backups. With a click on Restore on the right you can then start recovering the components you need. That’s it. The rest happens by itself. You can purchase many of these options on their own or get all of them in UpdraftPlus Premium starting at $70. However, for basic protection, the free version is absolutely sufficient. Of course, UpdraftPlus is not the only way to back up WordPress to offsite locations. Other plugins can do the same. Here are a number of options. 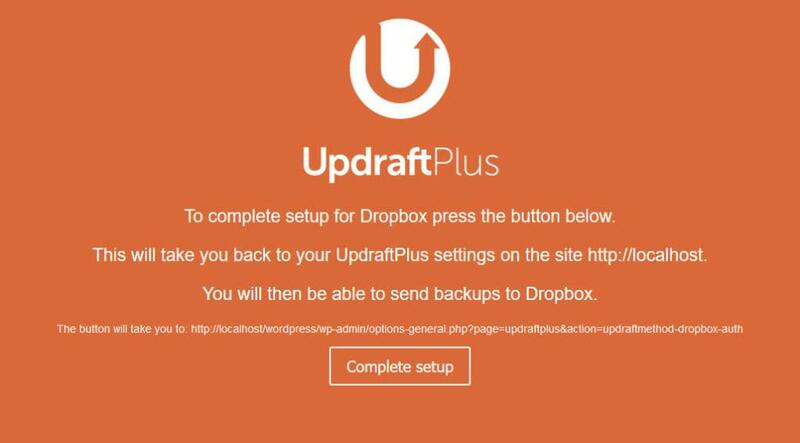 Another free option that includes remote backups to a similar range of services as UpdraftPlus. The plugin makes it easy to set up an automatic schedule. It can also optimize, check and repair your database. 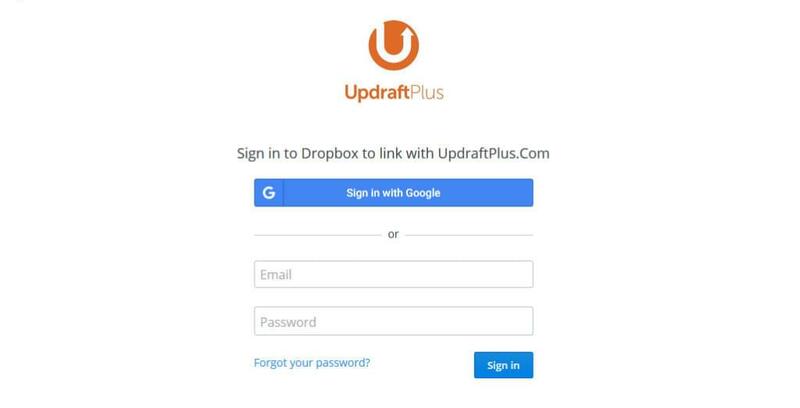 The pro version comes with priority support, the possibility to back up to Google Drive (which is included in UpdraftPlus out of the box) and other features. This plugin is one of my personal favorites for migrating WordPress websites, and it is also usable as a backup solution. However, for scheduled backups to remote locations, you need to purchase the premium version which starts at $39 for a year of backups and support. If the quality is the same as the free plugin, it might be worth the investment. BackupBuddy is a premium-only solution. It allows you to create a schedule and back your site up to Dropbox, FTP, Amazon S3, email and more. They even have their own service that provides real-time backup. 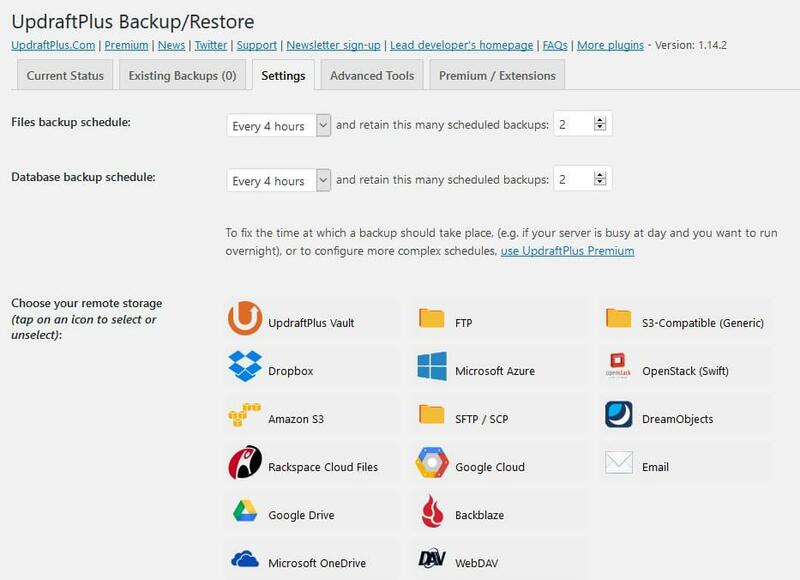 Plus, BackupBudy can duplicate, migrate and restore WordPress sites. Plans start at $80/year for one website. Finally, we have VaultPress which offers daily or real-time cloud backup for your site. The service is included in Jetpack, however, you need a subscription to use it. Plans start at $3.50/month, however, for real-time remote backups it takes the Professional plan which clocks in at $29/month or $299/year. You also need to install the Jetpack plugin (see our Jetpack guide for more info) and get a WordPress.com account. Yet, the effort can be worth it depending on your needs and site. A backup solution is an absolutely necessary part of any WordPress website. Without, the risk of losing your site and having no chance of recovery is just too great. While any solution in place is better than nothing, backing up WordPress remotely is a particularly great option. It keeps copies of your site in the cloud, making it less likely something will happen to them and giving you access to your backup from anywhere in the world. 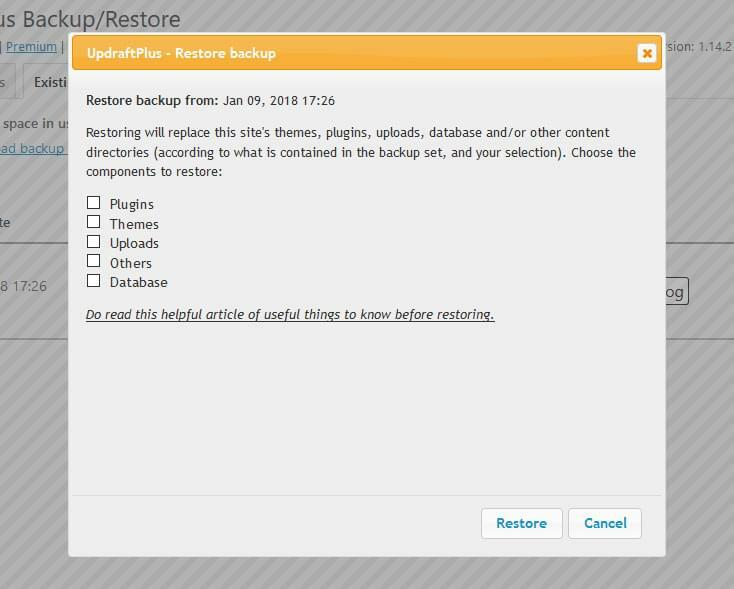 In this article, we have gone over how to back up WordPress remotely with the help of UpdraftPlus. 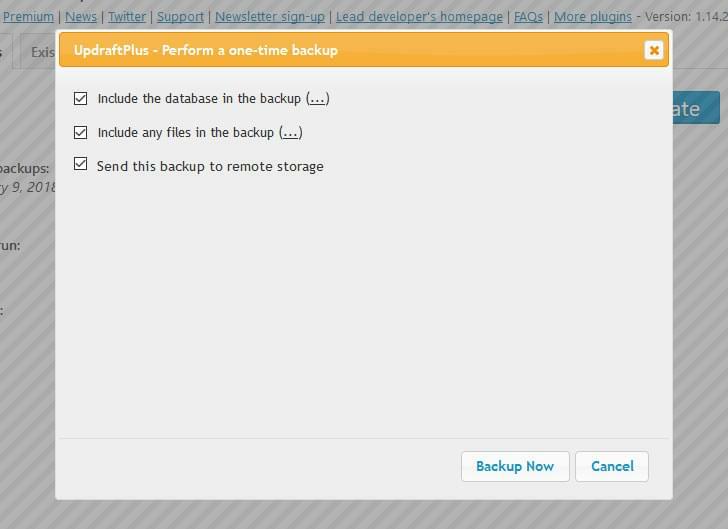 The plugin is a great free option to set up basic remote backup for your WordPress site. It also has many premium options that make the experience even better. If you want to shop around for another solution, you also find a few of those in this post. Whichever one you decide on, the important thing is that you have any system in place. In a worst-case scenario, it will dramatically lower your blood pressure. I promise. 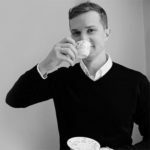 Nick SchÃ¤ferhoff is an entrepreneur, online marketer, and professional blogger from Germany. When not building websites, creating content or helping his clients improve their online business, he can most often be found at the gym, the dojo or traveling the world with his wife. You can get in touch with him via Twitter or through his website.